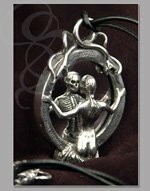 Keep your loved ones on ice with this gothic cemetery locket. It's stylish, dark and perfect for carrying photos of those who you can't live without. 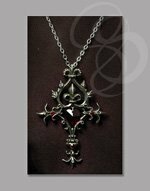 The locket is based on the Orthodox Eastern European Gothic style. It is crafted entirely of English pewter, with stunning minute details and lavish accents. What sort of lavish accents? Well, for starters, the abundant use of iris patterns around most of the locket. Also, the corniced black cabochon crystal at the center of the pendant. And let's not forget the beveled corner pieces that melt into stylized iris flowers. Getting the picture? 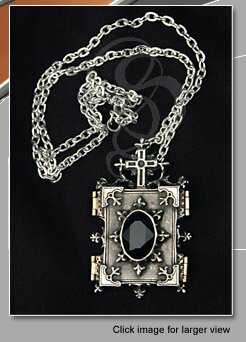 The locket is about 2 inches high from top of the cross to bottom of pendant. It has very cool brass hinges and fasteners and can hold 2 photos. Comes with a nickel-free chain and a whole lot of cool creepiness. Materials: Fine English Pewter Body. Brass Hinges and Latches. 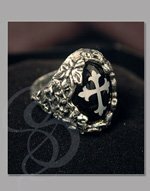 Black Cabochon Crystal. Nickel-Free Chain. Size: Approximately 2.25 inches high. Holds two photos approximately 1 1/4 inches by 3/4 inches.